The Organic Cook’s Bible is a much-needed resource that demystifies the array of organic ingredients available and details how to choose, store, and prepare them. An indispensible reference for home cooks, gardeners, and chefs, this book is much more than a produce guide; it also covers meat and poultry, diary and eggs, beans and grains, herbs and spices, and more-organized alphabetically within each section for easy reference. Although organic foods are more readily available than they were just a few years ago, it takes a little effort to go organic in today’s processed world. 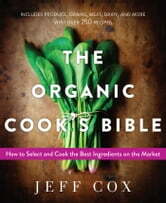 This book makes it easier, with in-depth descriptions of over 150 organic foods. It explains what makes these foods more flavorful nutritious than their nonorganic equivalents and gives information on nutrition, seasonality, what to look for, storage and preparation, and uses. More than 250 recipes capture the great taste of organic ingredients and add variety to everyday meals, with dishes like Winter Squash Soup with Pumpkin Seeds, Hazelnut-Crusted Pork Loin, and Rhubarb-Huckleberry Pie-many contributed by leading organic chefs. There’s even a special Top Varieties section that lists over 900 of the best varieties of organic and heirloom produce available in the United States.